I have many impressions to share from the PhoCusWright Travel Bloggers Summit at ITB Berlin. For a change I will start with my last impression: I was interviewed for the Austrian Tourism Blog. Thought of posting it first and adding more later when I’ve sorted the lot. 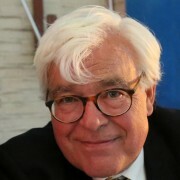 The interview was made by Rainer Edlinger of Edei’s Blog Recently Rainer was promoted to Hauptmann of the Zell am See Tourism office. I did pray that someone would come up with a better measurement to replace my dumb work. Moreover at the time Technorati seemed too outdated and too infested with scrapers and sploggers and what all. In June I discovered Frothy‘s Alexa only ranking. Then came Invesp. I mentioned it already back in July, that put several measurement methods in a basket and created its own list of Top Travel Blogs. From time to time I checked those and had a good reason not to go further with my own cumbersome list making. But now Technorati has really cleaned its act and rolled out a completely new approach in their Blog ranking. I have a feeling that they are moving in the same direction as Google search is moving. A nice way of reinventing yourself Technorati! 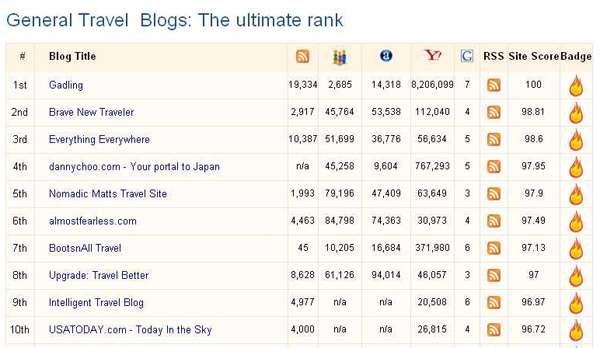 Top 150 General Travel Blogs according to Invesp – The ultimate Ranking ? Invesp Consulting managed to put together a ranking list of 150 General Travel Blogs without my (and Gary’s) help. I’m excited. Ever since I saw Happy Hotelier listed on one of them ranking lists, starting with the T-List, I got interested in lists. For some time I’ve tried to keep up with lists of travel bloggers according to their technorati ranking. I’ve tried to combine same with Alexa ranking, but as I did it by hand it took a lot (actually too much) of time and effort. We have seen other lists and comments as well: Many are of the opinion that a panel and/or public voting doesn’t reflect true reach of a travel blog. Let alone the mere technorati ranking or the mere Alexa ranking that I posted about recently…. In an update to this post I will analyze the list more in depth. In the meantime I decided to put my bragging badge in my sidebar. Khalid who seems responsible for the project blogs about it in How Does Blog Rank calculate the ultimate rank? and explains that they use 20+ parameters which they mix together with a different weight. Here I saw that Gary was also offering him help. Author gjePosted on July 28, 2009 February 28, 2016 Categories T-List, Travel Blogs20 Comments on Top 150 General Travel Blogs according to Invesp – The ultimate Ranking ? It immediately demonstrates the relative weakness of this measuring method, because the first 3 mentioned here are on Blogspot which is a site with millions of blogs….There are many more Travel Blogs on Blogspot. So when you go further with this without something else to measure you will end up with hundreds of Travel blogs ranking #8…..
I’ve added the category Internet Graveyard to this post as frothy passed away.